I'd like to thank all my supporters who got me through the month of no computer. All is fixed now. 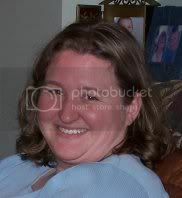 New hard drive, pictures in my camera uploaded and a clean slate in my 'Favorites' column. I don't think I'll be adding as many sites to that column. A good thing has come from this month away from the computer but I have many pictures I need to show you. Yes, I need to show you. 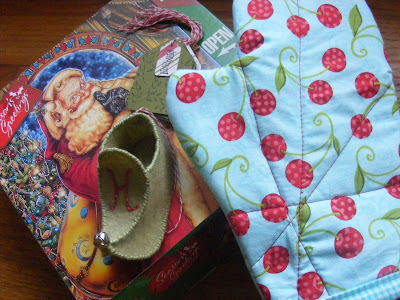 Holiday Traditions Swap going to Hazeljoy. We traditionally have a puzzle out for the month of December. We do a few pieces every day or so and friends & family who visit are welcome to add to the puzzle. Hazeljoy's birthday was in December so I made the cherry oven mitt for her birthday. I made a little elf show ornament for the required decoration and I sent her some little gift tags I made too. I made her a Christmas CD with the swap logo on the cover. 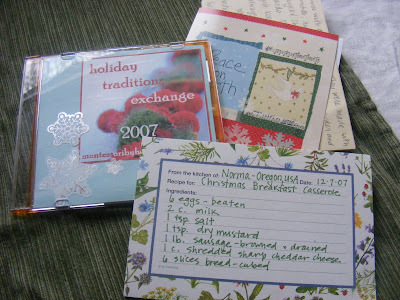 Required recipe and a Christmas card & letter explaining all. This is the packaging. 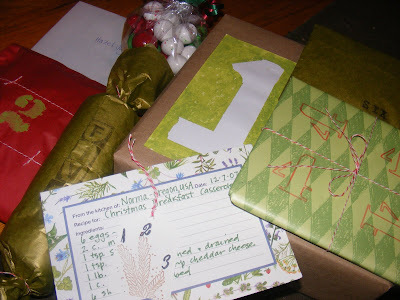 The letter of explanation was numbered explaining each gift to the corresponding package. She was a wonderful swap partner. I'll show her gifts to me tomorrow.